A survey conducted by the Nielsen company in April found that the iPad has an 82 percent market share of tablets in the U.S. A total of 43 percent of those polled said they own the 3G connected iPad, while 39 percent said they own the Wi-Fi-only model. The next closest competitor was the Samsung Galaxy Tab, with a 4 percent share. That was followed by the Dell Streak, which 3 percent of respondents owned, and the Motorola Xoom, which accounted for 2 percent of those polled. The survey also found that about half of all tablet owners are the only ones in their home that use their tablet, while 43 percent share the device with others. 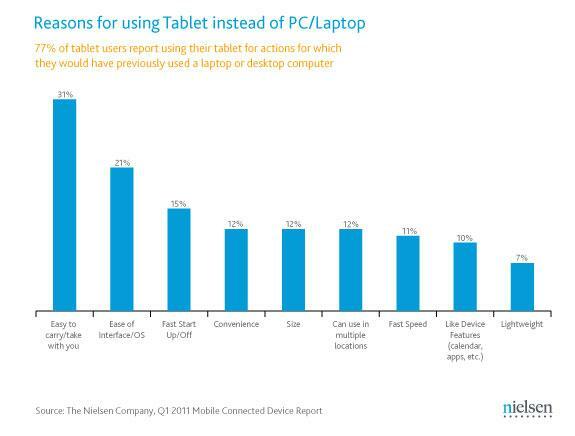 Since purchasing a tablet, 35 percent of those surveyed said they use their desktop less often or not at all. And 32 percent of those who own laptops said they use that computer less. Tablets also have an effect on the use of e-readers, the poll found, as 27 percent of respondents who own an e-reader said they use it less often or not at all. The same percentage held for portable media players, while 25 percent who own portable game consoles said they use those devices less often. Previous Nielsen surveys found that women prefer Apple's iPhone, while men tend to desire a Google Android handset as their next smartphone. And last June, it discovered that iPhone users download the most applications of any smartphone owners by far. News Corporation's The Daily, a newspaper-style publication that debuted on the iPad earlier this year and was the first to feature subscription billing, lost a total of $10 million in its first quarter of operation, according to paidContent.org. Most of those losses are said to be a result of investment costs associated with starting up the operation. A total of 800,000 downloads of The Daily have occurred since the publication debuted. It kicked-off with a free trial period until users were required to pay 99 cents per week for access. "It's really early days," News Corp president Chase Carey told analysts on his company's earnings conference call. "It's only a month-plus that it's been pay-based. It's actually one of the most downloaded news apps out there. It's a work-in-progress; we're proving the technology, refining the content. The tablet market is still in its infancy." The Daily debuted in early February for the iPad. Though it is initially only available on the iPad, News Corp. plans to bring it to other tablet devices in the future.